COPPERAS COVE, TX (October 23, 2018)—When a student enters the door of the classroom, he is not there solely for the knowledge he is supposed to gain. All of those lessons, terms, definitions, concepts, tests, quizzes and assignments have a hidden goal behind them: social-emotional development. While leadership skills can come naturally, children learn lessons along the way that significantly impacts them later in life. That’s exactly what Martin Walker Elementary’s Greeter Leader program is designed to do. Greeter Leaders are fifth grade volunteers who develop leadership skills through acts of service. 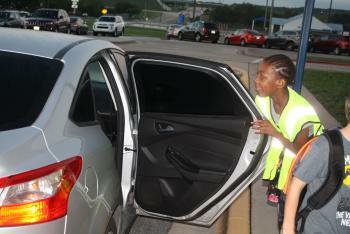 Duties include being positive and opening car doors to greet parents and students during morning drop-off. They also help younger students check out books in the library and properly post the American and Texas flags each morning and lower them each afternoon. Greeter Leader LaDeja Turner uses the program to challenge herself to get to school on time. Greeter Leader Avery Robinson likes the social aspect of the leadership opportunity. “I like meeting people. I have actually met younger children by greeting them in the morning who otherwise I might not have had the opportunity to know,” Robinson said. The Greeter Leaders tutor younger students by reviewing vocabulary, helping teachers before class to get prepared for the day, and presenting the morning announcements. The Greeter Leader program has resulted in fewer office referrals and increase grade point averages and test scores on the campus. All students who turned in signed permission slips were chosen to participate in the program. Students must maintain honor roll grades and not receive more than two office referrals throughout the school year to remain in the program. If a student’s grade drops, the student may attend tutorials to improve his grade. Once the student is earning honor roll grades again, he is allowed to return to participate in the program.